TORONTO — The mother of a Canadian man killed fighting Islamic State militants in northern Syria is questioning why her son's body still hasn't been recovered when the remains of a British fighter who died on the same day were on the way to the United Kingdom. 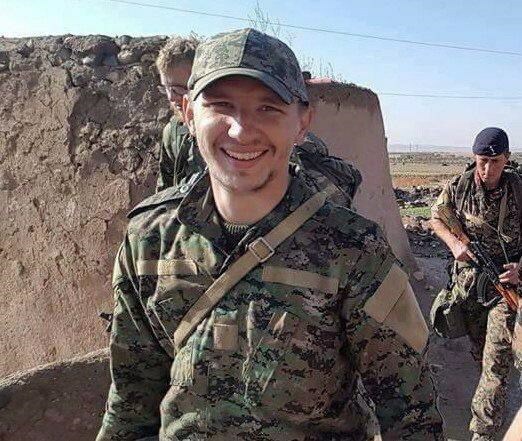 Nazzareno Tassone, 24, was killed on Dec. 21 in the city of Raqqa, while fighting alongside the Kurdish People's Defense Units, a U.S.-backed group also known as the YPG. His family in Niagara Falls, Ont., only learned of his death in early January, when they received a letter from the YPG, which also said that his body had been seized by the Islamic State of Iraq and the Levant, known as ISIS or ISIL. "I just want him home. I need him home," Tassone's mother, Tina Martino, said in an emotional interview. "I haven't been at work. I just sit here, day after day, waiting for the phone to ring and hope." The Toronto Kurdish Community Centre, whose leaders delivered the YPG letter to Martino, has said negotiations are underway between the YPG and ISIL to retrieve Tassone's body. The centre has also said that the YPG was simultaneously negotiating to recover the bodies of other fighters killed in combat on the same day as Tassone, including a British volunteer fighter named Ryan Lock. Martino said she recently learned Lock's body was recovered, making her wonder why her son's body has not. "I asked why wasn't Nazz with Ryan and the only thing they could say was that they believe the two boys were not together at the same time," she said. "(The Toronto Kurdish Community Centre) told me at the beginning I was going to have to wait four to six weeks. And now I don't understand, he passed away on Dec. 21." Martino said she's calling on the Canadian government, the Kurdish community and anyone who can help in the matter to do what they can to bring her son's body back to Canada. "All I want to do is get my word out in asking to get my son home," she said. Ihsan Kaya, co-president of the Toronto Kurdish Community Centre, said he's been in contact with the YPG regularly about Tassone and noted that the Canadian man and his British co-fighter may have been separated but were believed to be fighting in the same area. "The YPG doesn't have (Tassone's) body yet but I hope we get the good news soon," Kaya said, adding that the region the YPG is fighting in is a volatile one with fast-shifting boundaries. Global Affairs Canada said officials were in contact with local authorities to gather information and were also providing Tassone's family with consular assistance. A spokeswoman noted, however, that "due to the unpredictable security situation" the Canadian government's ability to provide consular assistance in all parts of Iraq and Syria is severely limited. Tassone left Canada in June, telling his family he was headed to Iraq and Turkey to teach English. His family had suspected, given Tassone's long-standing interest in the military, that he might get involved in the Middle East conflict, but it was only after his death that they learned he'd been fighting in Syria. Martino said she's vowed not to have a funeral for her son until his body was repatriated. "I said that there would be no funeral, there would be nothing. But now I don't know."